The Crystal Classics team first started to arrive to rather wet weather when we landed at Phoenix.The following morning we collected our cars and drove to sort our stock which was due to arrive in Tucson. This year we have so much stock we had no choice but to consider a different strategy. All our retail stock was delivered at our place of residence, Via de Suenos west of Tucson, and the Wholesale stock was delivered directly to the Hotel Tucson City Centre. Hotel Tucson City Centre and Westward Look a little later on. 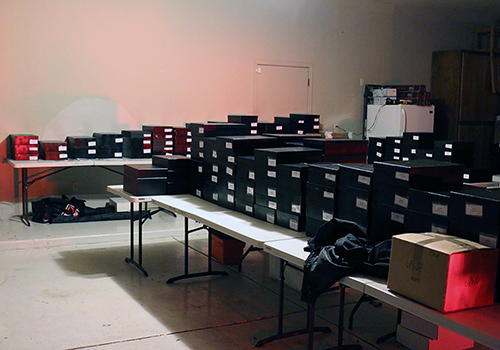 filled with all our high-quality wholesale minerals. Here temporary recruit Frank Aloe from Australia helps unpack the crates with Peter Schlegel. Quartz....etc. in one of our showcases. Dave Hacker with Frank sorting through some of the wholesale mineral stock. Peter and Katrin Schlegel showing some of the minerals in the wholesale Mission Room suite. Soon the room was full of keen-eyed collectors and dealers all looking for the bargains. Some of the larger specimens on show in the display cases. Diana at the door of the retail room. exhibiting a colourful array of fine specimens from around the world. Here are just a few of the great specimens on show in our retail room in the foyer of the hotel Tucson City Centre. Please note, all of these specimens are now currently on show and available to buy. If any are of interest please do not delay. Let us know and we can reserve the specimens of your choice. from Tsumeb Mine, Otjikoto Region, Namibia. Azurite crystal cluster from Bisbee, Warren District, Mule Mts., Cochise County, Arizona, USA. Rich Pink Cobaltoan Dolomite "cast"
showing the typical clarity of these collectable pieces. Herkimer County, New York State, USA. from Bunker Hill Mine, Kellogg, Coeur d'Alene District, Shoshone Co., Idaho, USA. from Jeffrey Quarry, Asbestos, Quebec, Canada. from Perran St. George Mine, Perranzabuloe, St. Agnes District, Cornwall, England, UK. from the Francon Quarry, Montréal, Québec, Canada. Of Course, Crystal Classics are not the only dealers here at the Hotel Tucson City Centre. 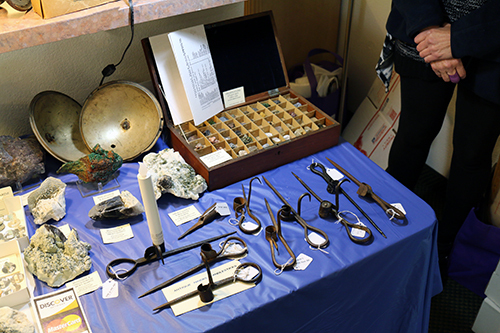 We took some time to have a look and see what some of the other dealers had. 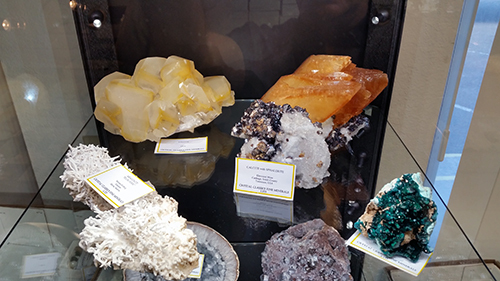 Our first port of call was Crystal Springs Mineral and Jewellery Co.
Thomas Nagin (Proprietor) allowed us to photograph some of the fine specimens and jewellery they have there. partly because of their rather strange terminations. Here you can clearly see the "amethyst" and the Citrine colours separated out. Exquisite clusters of blue Kyanite Crystals from Minas Gerais, Brazil. Fighting eagles carved from Lapis Lazuli perched on top of a Quartz crystal cluster. Moving into the next room we found Minerama at their new indoor location. "Grape Chalcedony" for perhaps obvious reasons. From Mamuju area, Sulawesi Barat Province, Sulawesi, Indonesia. A closer look at the structure of the "Grape chalcedony"
detailing the spherical nature of these little aggregates. John Cornish, a regular to Tucson had a couple of great little specimens worthy of mention. from Elk Creek locality, Dalzell, Meade Co., South Dakota, USA. .Jackson's Crossroads, Wilkes Co., Georgia, USA. a rare minerals collection wooden boxed set. Rum Jungle, Batchelor, Coomalie Shire, Northern Territory, Australia. display of minerals from the Deccan Traps. chemically as being somewhere between Okenite and Mordenite. From Nashik Quarry, Nashik District, Maharashtra, India. This just the beginning of the Tuscon experience for 2017. We'll be back shortly with more mineral news from the Westward Look show.